Mumbai: November shipments from India’s largest iron ore exporting port, Mormugao in Goa state, recovered from last month but still down 6% at 3.19 million tonnes on year, as firmer prices made shipments feasible from the western state with lower freight. “Feasibility is there from Goa port... there is good demand for low grade in China and Orissa ores are unavailable," said Dhruv Goel, managing director, with SteelMint, an iron ore trader in eastern Orissa state. Freight charges from Orissa to any other eastern port costs an average of 2,700-3,000 rupees ($53-58) per tonne, compared to Goa’s 1,200 rupees, making Goan cargoes more viable, traders said. “Demand is pretty good from China since last week," said Goel, adding it is not difficult to sell readily available cargoes. The port is the biggest shipper of the steel making ingredient from India, normally the world’s third-largest iron ore exporter. Exports of the steel-making ingredient fell 13.9% to 17.9 million tonnes in the first eight months of the fiscal year, which started in April. India’s biggest iron ore exporter, SESA Goa, shipped 404,115 tonnes of iron ore to China, India’s biggest buyer of the fines. 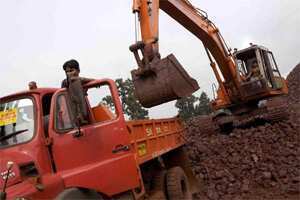 India’s export of iron ore has been affected by a series of scandals over illegal mining in Karnataka and Goa, the top ore producing states of the country. A report on allegations of illegal mining in Goa is expected to be submitted to the federal mines ministry this month. Justice M.B. Shah, head of the panel, had said it will be very difficult to control illegal mining unless exports are controlled. Iron ore exports are yet resume from the southern state of Karnataka, which accounted for a quarter of shipments before the state government imposed a ban, even though the Supreme Court ordered the ban lifted in April.